The rotator cuff is comprised of four muscles that control shoulder motion and specifically overhead use of the arm. They can be injured from either trauma or chronic use. When they begin to tear away from the humerus bone, they cause shoulder pain and sometimes weakness with overhead activity. Many patients report increased shoulder pain at night when they roll onto their affected shoulder. Also, pain with activities of daily living causes many patients to seek medical attention. Treatment for a rotator cuff tear often begins with good physical therapy. Strengthening of the affected muscles and the surrounding muscles often relieves symptoms. Non- steroidal anti-inflammatory medications and cortisone injections can also be used in conjunction. If the tendon is completely torn away from its attachement on the humerus then surgery may be required. Most rotator cuff surgery is performed on an outpatient basis with the use of arthroscopic surgical tools. This means that small incisions and cameras are used to assist in the repair. Occasionally some rotator cuff tears are simply too extensive to be repaired. These massive tears can be treated with different types of shoulder replacement. Following shoulder surgery, a sling and shoulder immobilizer may be used for many weeks prior to physical therapy and eventual shoulder rehabilitation. 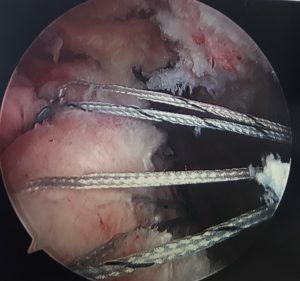 It can take three to six months following a significant repair for complete resolution of symptoms and for full healing of the rotator cuff. If you have shoulder pain or questions regarding rotator cuff tears, please schedule an appointment to see Dr Stiebel at either our West Palm Beach or Jupiter offices. Dr Stiebel is a board certified orthopaedic surgeon with a special interest in rotator cuff tears. He is an instructor for the Arthroscopy Association of North America and teaches the latest techniques to other surgeons both nationally and internationally.